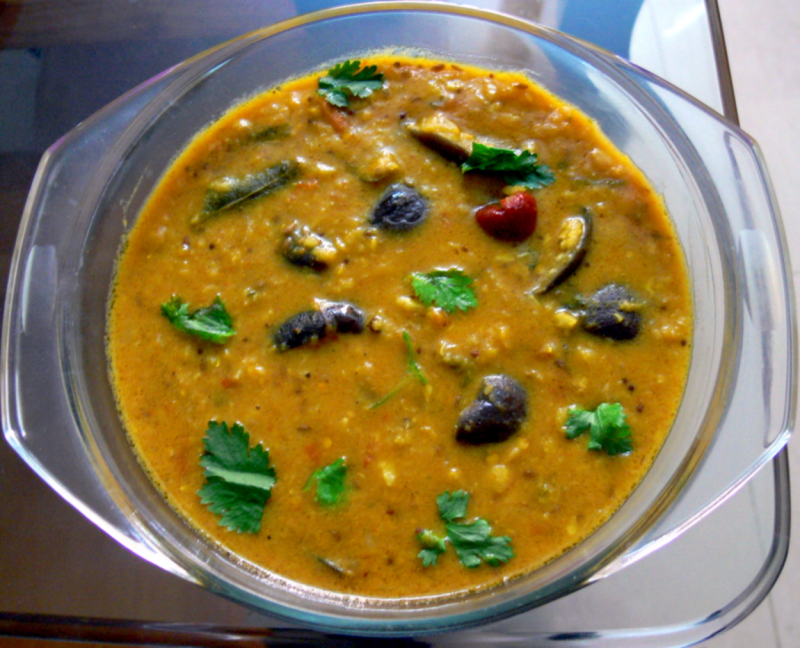 This recipe gives you the tasty preparation of Brinjal Sambar using Microwave Oven. Try at home, O.K this dish and post your comments.U can try Okra(Ladies-Finger) Sambar by adding oil-sauted Okra pieces instead of Brinjal pieces in Step 3. Take a microwavable bowl,add cleaned toordhal,chopped onion,chopped tomato,turmeric powder,asafoetida powder,green chilli,1 tsp cumin seeds,few coriander leaves and garlic pearls. Measure 600 ml water and add it to the bowl.Mix them well and microwave them on high for 35 mins. Then take the bowl out and add tamarind extract(400 ml),sambar powder,salt and brinjal pieces. Microwave this for 18 more mins.Then take the bowl out. Take another bowl,add 2 tsp refined oil,chopped onions,mustard seeds,remaining(1/2 tsp) cumin seeds,whole red chillies and curry leaves. Microwave this on high for 2 mins.Take the bowl out and add the seasoning(tadka) to the first bowl.Mix the Sambar well. Sprinkle ghee on top and garnish with coriander leaves. Now this tasty Brinjal Sambar is ready to be served with rice. Hi ! Christy ... Nice Recipe and your Sambar looks Delicious . Thank U . Brinjal is an excellent source of dietary fiber .Gud source of Vitamin B1 , B6 nd Potassium . Also contains Copper, Magnesium , Manganese , Phosphorous , Niacin nd Folic acid . Brinjal is gud for Type 2 Diabetes as it has high fiber and low soluble Carbohydrate . It controls the glucose absorption and reduces high blood pressure .